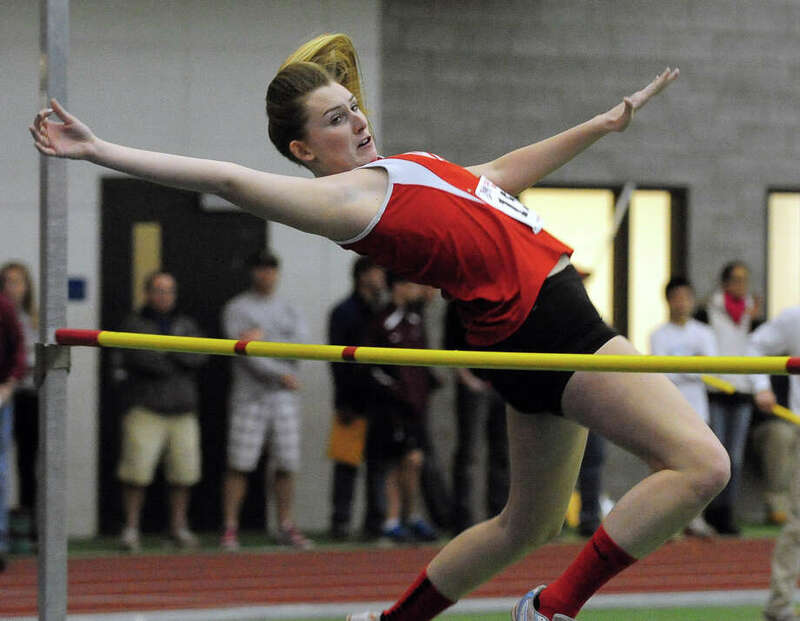 Fairfield Warde's Jackie Seymour competes in the high jump, during Class L Championship track action at Hillhouse High School's Floyd Little Athletic Center in New Haven, Conn. on Thursday February 6, 2014. Fairfield Prep senior Christian Alvarado, of Fairfield, won two events for the second year in a row at the CIAC Class LL indoor track and field championship meet on Feb. 8 at the Floyd Little Athletic Center at Hillhouse High School in New Haven. His victories in the 1,600 meters and 3,200 helped the Jesuits, who compiled 20 points, place eighth among the 24 teams that scored points. Danbury won with 64 points, followed by Ridgefield (61) and Staples (46). Fairfield Warde senior Cate Allen surpassed the previous meet records in the 1,600 and 3,200 in Class L but finished second in both as the Mustangs (28 points) finished sixth of 21 teams on Feb. 6 in New Haven. Darien (87) won, with Wilbur Cross (65) second and Windsor (50) third. Also at that meet, Warde and Fairfield Ludlowe finished in a tie for 24th in the boys meet. Mustangs' senior Aidan Fiol placed sixth in the 3,200 with a time of 9 minutes and 48.94 seconds. The Falcons' 4-by-400-meter relay (Josh Archer, Dan Leto, Taylor Szemplinski, Zach Kenton) finished sixth in 3:42.07. Last Saturday at the Class LL girls meet, Ludlowe (17 points) placed 12th of 22 schools. Staples (63) won with Simsbury (55) second and Glastonbury (49) third. Falcons' junior Emma Koether was third in the 300 in 42.45 seconds and junior Rachel Hurst took fifth in 43.41. Senior Alex Wykoff was third in the 55-meter hurdles in 8.86. Junior Emily O'Keefe placed fifth in the high jump with a leap of 4-feet, 10-inches. The Falcons' 4x200 relay (Hurst, Ali Gorab, Ali Johnson, Koether) was sixth in 1:50.65. Alvarado, the State Open champion in cross country, repeated his 2013 win in the 1,600 in 4:22.34. He repeated in the 3,200 in 9:28.54. "This is the first time I've won both at the state level and it's a great thrill," Alvarado said. "Last week I did a 9:20, so, I knew that if I stayed calm I'd be able to finish with a win." Allen had won four Class L individual events in her three previous years. She was runner-up to Wilbur Cross's Danae Rivers in the 1,600 and to Mercy's Kaleigh Roberts in the 3,200. Both of Allen's times -- 4:57.4 in the 1,600 and 10:59.96 in the 3,200 -- eclipsed the previous meet records. Her 1,600 time set a new school record. Allen was leading Roberts narrowly when the bell rang to signal the final lap. She held Roberts off but there was another lap to go. "I've never seen that happen before," Allen said. "They got a little mixed up with the laps. I was walking off and they said, `You've gotta go out there.' I felt stronger than I usually do in the 3,200." Allen said Rivers had an awesome kick in the metric mile. "I hope to hold my kick at the State Open (Saturday)." Warde coach Shawn Sorbello filed a protest at the meet and was told before it ended that it was upheld. The result was not overturned -- Roberts remained the official winner -- but All-State honors go only to the first-place finisher. So in this instance, meet officials decided that Roberts and Allen each should and will be awarded All-State from the race. Warde's 4x800 relay finished third in 10:05.77 with Paige Hanley, Roey Mappa, Quinn Igram and Hannah Dougherty. "We wanted to run our best time," Hanley said. "We wanted to pace off the others. We did really good." "They walked away with a good time," Mustangs coach Shawn Sorbello said. "They got the job done." The Mustangs' sprint medley relay, of Blossom Jean-Jacques, Sarah Reilly, Dougherty and Hanley, was fourth in 4:29.26. Jean-Jacques, a senior, placed fifth in the high jump at 4-10.